Update 13 Sept. 2018: Cohort 3 apps will be taken through Oct. 29, 2018. Landing page link in story below.-Ed. It's never easy being a startup, and for startup energy companies the path to commercial viability has become increasingly difficult. 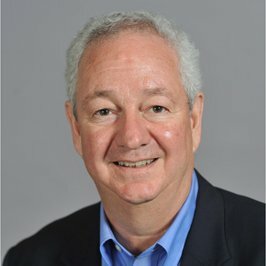 Innovation Crossroads was born in 2016 to address the struggle of getting typically R&D-heavy technologies to market, said Tom Rogers, director of Oak Ridge National Laboratory's industrial and economic development partnerships division and leader of the program. "The national venture investments in energy start-ups have been declining over the past 10 years," said Rogers. Compared to other types of technology, such as software applications, it can take "seven, eight, 10 years" for these technologies to mature, he said. Getting funding in the early start-up phase helps developers prove the concept and become a more viable opportunity for investors, he said. "I don't think any of the companies are going to be revenue positive at the end of a two-year period," Rogers said. "Our goal is a path forward." The Innovation Crossroads start-ups are tackling a range of energy-related problems. Concepts range from storage systems to materials to a low-cost, easy-to-build nuclear reactor to recycling. They come from institutions including Cornell, Duke, Georgia Institute of Technology and Vanderbilt. "Over the last 18 months we've had over 100 applications from probably 25 states," Rogers said. "It's best and brightest. In all instances this is a spin-in program, so they're bringing their ideas with them." In September, Innovation Crossroads will open the window for applications for its third cohort of businesses, which will begin work in May 2019. The solicitation provided for the program's first two cohorts is here (pdf). A link to receive program announcements is available here. Cohort 1: Active Energy Systems (Mitch Ishmael, Knoxville); SkyNano Technologies (Anna Douglas, Nashville); YellowStone Energy (Matt Ellis, Samuel Shaner, Knoxville-Oak Ridge). DOE recently announced $2.6MM in funding for YellowStone. Cohort 2: Ascend Manufacturing (Justin Nussbaum, Tampa); Eonix Energy (Donald DeRosa, Albany, NY); Lux Semiconductors (Shane McMahon, Albany, NY); Nth Cycle (Megan O'Connor, New Haven); TCPoly (Matthew Smith, Atlanta). Rogers acknowledged that clear communications and mutual understanding between goal-oriented entrepreneurs and scientists or engineers within an institution like ORNL can be a challenge. He said he sees the driving force behind cultural change as being the entrepreneurs, themselves. ORNL/Innovation Crossroads announced in spring 2017 that Ming Qi, PhD, the founder of Knoxville-based Peroxygen Systems who previously earned his doctorate in chemical engineering at the University of Tennessee (UT), had also been chosen for Cohort 1. However, Rogers today explained that he and others associated with the ORNL program had soon after that announcement learned they had erred in interpreting the program's requirement for establishing U.S. residency, and had mistakenly informed Qi that he had been admitted. Rogers said Qi did "very well" in competing for a berth in the program, and he regretted the "miscommunication," adding that the Innovation Crossroads program is young and learning as it moves forward. Qi remains "an important part of the entrepreneurial ecosystem" in the region, said Rogers, who confirmed his office is not actively engaged with Qi, at this time. Reached by VNC this afternoon, Qi declined to comment at this time. receiving 2016 TN Venture Challenge Prize. 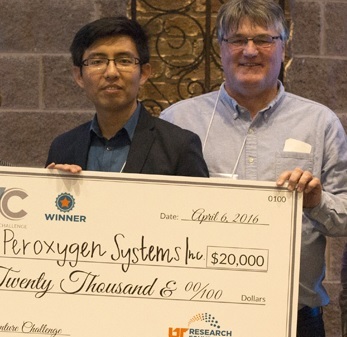 In 2017, Qi's Peroxygen, which has an advanced method of generating hydrogen peroxide, received a $225K SBIR from the National Science Foundation; was invited into the MassChallenge Energy/Cleantech program; and, among other recognition and awards, in 2016 Qi and his company won the 2016 Tennessee Venture Challenge and collaborated with UT colleagues on ARPA-E research. Commenting on the early impact of Innovation Crossroads, Rogers said, "It's really been an inspiration to some of the research scientists out there," said Rogers. "These kids are fun to be around, they're smart and they're driven, and their enthusiasm is infectious. They're really doing this." While Rogers doesn't expect all the companies working with ORNL to put down permanent roots in Tennessee (aside from Active Energy Systems, the lead entrepreneurs in its two cohorts all come from outside the state), these interactions increase the odds of long-term local economic benefit. "Our job is to help them grow successful businesses," he said. "But I've always believed that technology doesn't mail very well. I think the odds are pretty good across the eight companies that several of them will see the advantages to staying at ORNL and this entrepreneurial culture that we're surrounding them with." According to their LinkedIn profiles, members of the existing Cohorts hold or are near completion of advanced degrees from Cornell University, Duke University, Georgia Institute for Technology, Massachusetts Institute of Technology, State University of New York at Albany, University of South Florida, and Vanderbilt University. Innovation Crossroads partners with, among others, Tennessee Advanced Energy Business Council (TAEBC and its Energy Mentor Network) and Launch Tennessee (the state's TTDC, Tennessee Technology Development Corporation, affiliated with Tennessee Economic & Community Development).